Recently I was given the opportunity to preview an upcoming new game that is currently available to back on Kickstarter. I received a prototype copy of the game and rules. These are my thoughts and opinions on the presented materials. Enjoy! 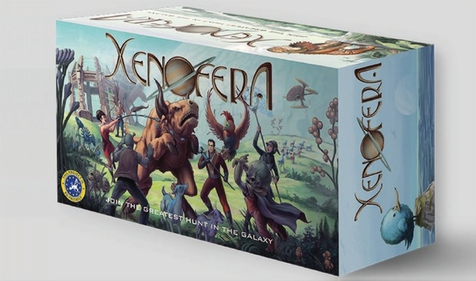 Xenofera is a game by Liz Gattra and Jeff Porter. The game is self published. It is for 2-5 players. In this game, players take on the role of an experienced huntsmen from a distant galaxy. They’ve each been hired by a noble member of the Royal Society of Xenofera Huntsmen to compete for them in the once in a decade, Great Galactic Hunt. They will have to recruit the best crew and build the strongest cages in hopes of capturing the most appealing creatures. Of course they’ll have to be careful as their opponents may try and steal their creatures or even sabotage their expedition. In the end the player that can garner the most points throughout the hunt, will be declared the winner. To begin, the Huntsman deck is shuffled. Each player is then dealt 2 card face down. Players select one of the Huntsmen and place it in front of themself face up. The other cards are then shuffled back into the Huntsman deck which is placed to the side of the play area. The Creature deck is shuffled. The top 5 cards are then flipped over into a row beside deck known as the “Line of Sight”. The Collection deck is shuffled and 2 cards are dealt to each player face down. Players keep 1 and place it facedown next to their Huntsman. The other card are shuffled back into the deck which is then placed to the side of the play area. Each player is given a set of Battle cards and a Player Turn card. 2 small animal cages, 2 steel cages and 2 glass enclosure with divider cards are removed from the draw deck. These are shuffled and 1 card is dealt to each player. 1 expedition member for each player is removed from the draw deck. These are shuffled together and 1 is dealt to each player. The remaining cages are returned to the draw deck and reshuffled. Players are dealt 4 additional cards from the deck. If a player is dealt a Stampede card, it is randomly placed back into the draw deck and the player is dealt a replacement card. The first player is chosen and play now begins. The game is played over several rounds. Each round players will take a turn. A player’s turn consists of 5 phases; action, build, capture, draw and renew huntsman and crew members. The first phase of a player’s turn is the build phase. In this phase the player may take up to two actions. One action they can take is to place a crew member from their hand into their crew quarters. These cards are placed beside the player’s Huntsman character card. Each player only has room for 5 crew members to be placed in addition to their Huntsman. Another action the player can take is to play any regular action card. This is done by simply placing it in front of themself and following the instructions on the card. The card is then discarded. The next phase is the build phase. In this phase the player can use the build points provided by their Huntsman and any crew members they have in their crew quarters to build a cage or item from the cards in their hand. The item is then place into the player’s cargo bay. It should be noted that the cargo bay can only hold 10 cages and 1 alarm. When a Huntsman or crew member is used to build with, their card is turned sideways to indicate they’ve been used. As long as the player still has enough points to build with, they can continue building as many items or cages that they’d like. However, build points contributed by a Huntsman or crew member do not pool and so any overage is lost and can not be used to build another cage or item that turn. The third phase is the capture phase. In this phase the player can use the capture points of their Huntsman or any of their crew members along with the cages that they’ve built to capture a creature. It should be noted that the cage must be the correct size of the creature the player wishes to capture. Like with building, once a Huntsman or crew member has been used for their capture points, they are turned sideways to indicate they’ve been used. As long as the player still has enough points to capture creatures with and they have the correct sized cages, they can continue capturing creatures. However just like build points, capture points contributed by a Huntsman or crew member do not pool and so any overage is lost and can not be used to capture another creature that turn. It should also be noted that Huntsman and crew members that were used to build with can not be used to capture with in the same turn. Once a character is used, they are exhausted and unavailable for the remainder of the turn. The next phase is the draw phase. In this phase, the player is allowed to perform one of the following actions. They can either discard any number of cards and draw back to their hand size of 6 cards, or they can draw 2 Collection cards, keep 1 and shuffle the other back into the Collection deck. The final phase is to renew Huntsman and crew members. In this phase, the player turns any Huntsman or crew members that were exhausted and turned sideways back to their correct orientation. These characters can be used again on the player’s next turn. It should be noted that some cards when played will trigger a battle. When this happens, a series of events occur. First, each player that’s involved in the battle must select 2 cards from their Battle cards and place them face down on the table. The cards are then revealed and the player with the highest total wins. Ties go to the attacker. The cards are then discarded to the player’s used weapons pile and are unavailable for the next battle. The decoy however is the exception. It is returned to the Battle card pile to be used again. Once a player has only the Decoy in their Battle card pile, then the other Battle cards are returned to the pile and are available to be used again. The game continues until the last round is triggered. This can happen in one of 2 different ways. If the last card is drawn from the Draw deck, the last round triggers. Another way the last round can trigger is if a player has the minimum required number of occupied cages. They then call, “Last Round”. The number of occupied cages required depends on the number of players. Once the last round has been triggered, all players have one last turn except for the player that triggered the last round. Final scoring than occurs. Players add up the value of all the creatures in their Cargo Bay as well as any bonus points they’ve collected from successfully completed Collections. The player must also subtract any Failure costs from Collections they failed to complete as well as subtracting crew members costs. Once this is complete, players compare their scores. The player with the highest score is the winner. Since this is only a prototype I won’t go into a lot of detail here. If you want a better idea of what the actual components look like, I’ll point you to the Kickstarter link below. This will give you a better idea of how the components look and what comes included with the game. As for the prototype, the artwork is really great looking and looks like something from a fantasy novel. The quality of the cards, even in prototype form is pretty darn good. I’m impressed with the overall look and design at this point. I especially like the different creature cards. To me they’re the most interesting. Looking at the campaign page for the game, the artwork appears to be even better and more refined. From what I’ve seen, there’s a wealth of great looking cards that will be made even better once the game is produced. Overall, I’m thrilled with the game. Just like the components, the rulebook is a prototype as well. Even so, I have to say that the design and look is quite nice. There’s a nice background into the story behind the game to add a little flavor to the mix. There are plenty of pictures and examples which are a plus in my book. There’s even a great set up diagram to show you how everything should look. The phases of a player’s turn are all lined up and detailed really nicely. There’s even a great section that details all the different card types and what each part means on the card. Also included in the box was a really nice sheet that goes over a round of play with pictures and examples. REALLY nice! Finally there is a card inventory sheet included that explains each of the different cards and gives all the pertinent information about each one. In my opinion, what’s not to like. For a prototype, a lot of work was put into making everything just right. If that much work was put into this, you can expect to see even better in the finished product. Once again, I’m thrilled and can’t find anything to complain about. This is an enjoyable game. The game is at it’s heart a hand management game with elements of set collection, take that and some resource management. I love building cages and capturing creatures. You really have to balance the line between the two actions though. Do you use all your crew members and Huntsman to build this turn or do you try to save a bit for that creature that you want to capture. Battles are kind of like that too. Just because this is your first fight doesn’t mean that you want to use your highest numbers to fend off the attack, because the next time you battle the other players already know that you won’t have those numbers to fight with. Basically you make yourself a sitting duck until you get the rest of your Battle cards back. I kind of wish there was some way to make this a bit more balanced, like perhaps a dice roll added to the Battle card total or something like that, just to make it a bit more fair. In any event, what it all comes down to is balance. As you can see, there’s a nice bit of strategy involved in the game. It’s nothing so deep that you’re gonna find yourself overanalyzing or going all AP prone. It’s just enough to add a little bit of tension to the game. I will say that luck of the draw does tend to be fairly high here. So if you’re not up for a bit of randomness then this might not be a game that interests you. However it doesn’t bother me so I don’t have a problem with it. Collections seems to be the best way to really score points and it gives you a real direction for you to strive toward. I’m not necessarily fond of the negative scores for uncompleted Collections but that would be one of the few complaints that I have. In any case, I like the game. It’s really interesting and fun. I would recommend giving it a try. Fans of hand management or set collection games should enjoy this one. It’s definitely different from anything that you already have in your collection. 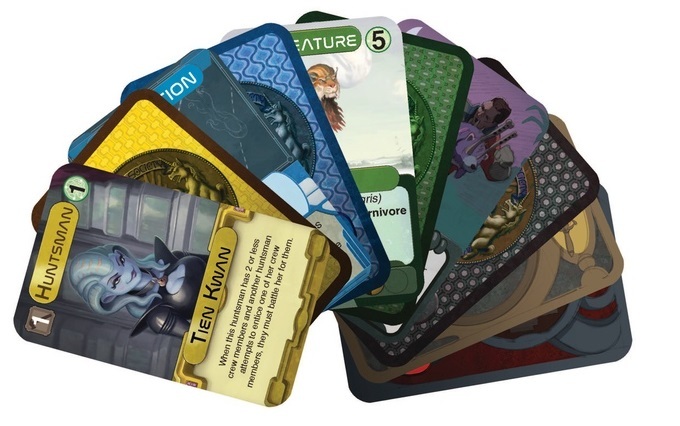 Xenofera is a card game that mixes hand management with take that and set collection to create a truly unique experience. The game doesn’t take too long to play. Most game sessions last about 30-45 minutes. The artwork is really good and the cards are very good quality, even for a simple prototype. I really like the different creatures. The game for me is all about balance, trying to find that balance in every decision that you make. There are plenty of choices to make and a good bit of strategy, however the game doesn’t cause AP or any other issues that should interfere with the game. I do wish that the battles had a little more balance to them, as I find that many times players tend to gang up on the weakest opponent at the time due to how easy it is to keep track of the cards that players have already used. The game does tend to have a fair bit of randomness to it. However if you’re like me, it’s fine and won’t be that big of a problem. Fans of hand management and set collection games should enjoy this one. It’s really quite different from most of the games on the market. Overall I like the game and think that it will only get better once produced. I would recommend giving it a try. The next great Huntsman could be you. For more information about this game, please check out the game’s site. This entry was posted in Preview Reviews and tagged board, board games, card, card games, games, gattra, jeff, jeff porter, liz, liz gattra, porter, xenofera. Bookmark the permalink.